Step 1: Create an Application in Netbeans. Name the application CalculatorProgram. If you don’t know how to create new application. 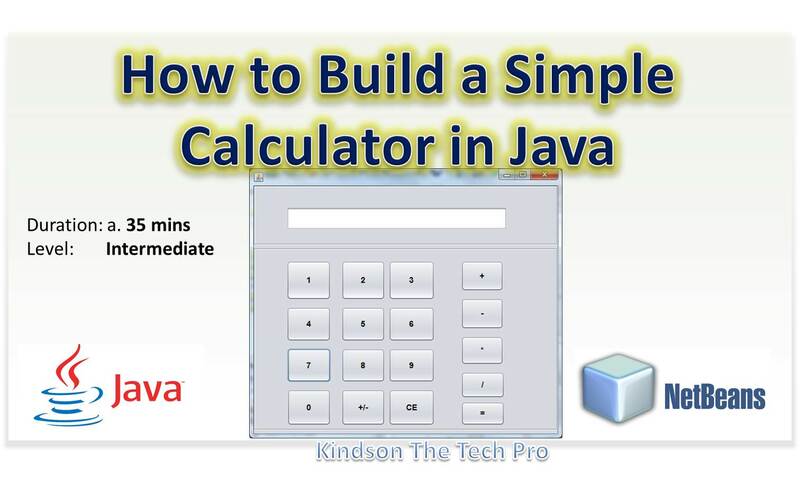 You can get it here: Your First Java Program. Step 3: Add two JPanels to the form and then resize and position them as shown. You can get Panels at the right hand side in the palettes tab. See Step 4b to delete the jTextField1. You need to place a TextField on the form, by clicking on TextField from the Palette and clicking in the upper part of the form. Drag to position it as shown in the figure below. Right-click on the TextField and click on Edit Text. Delete the text there. Right-click again and click on ‘Change Variable Name…’. To change the name of a button, right click on the button and choose “Edit Text”. For button 1, just type 1, for button 2, type 2 and so on exactly as it appears below. 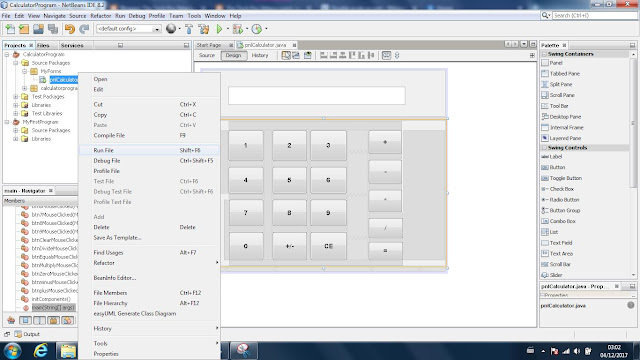 Step 7: Change the Variable Names of the buttons. Click on the Projects tab, locate the name of the Form. In this case it is pnlCalculator.java. Right-click on it and click on Run File. You wait for a couple of seconds and if you did everything correctly, the form below would be displayed. You can then close the preview form. Step 9: View your source code and locate where you will write your first code. Once in the code view, you can scroll up a little to find the position where you would write your first code. Step 11: Write the code for Button 1(btn1). Right-click on button 1 > Choose Events > Choose Mouse, Choose MouseClicked. Below the next line that says…//TODO, you can write your code. You can test your program using the procedure you applied in Step 8. When the form displays, Click on 1 to see what happens. If you did everything right, 1 would appear in the display. Step 14: Write the code for Button 2(btn2). Right-click on button 2, Choose Events, Choose Mouse, Choose MouseClicked. Step 17: Take some time to look through the codes to make sure you got it right. And also get used to various parts of the code. But don’t modify anything! This is the code that would clear the display when the CE button is clicked. Very simple, right? Note that nothing happens when you click the equals button. Now let’s write code for the equality sign to perform the calculation. Run the program and try a few calculations. What are your observations. You can leave a comment in the comment box below to let me know what you observe. Are there some questions, leave it in the comment box below.